Herald by T.A. Creech is now available! Danny’s life has never been easy or straightforward. Farm life with his brothers was supposed to be a quiet existence, something he needed after his medical discharge from the Army. Then an angel fell from the sky. Four days before Christmas, two more followed, and Danny hasn’t the faintest idea why he’s so ensnared by one of them, but he is. Of course, Gabriel isn’t at all pleased about getting knocked off his perch. It was too soon to be back on Earth. Too soon to fall into the trap of humanity and a mate. Resistance is the only option Gabriel has against mortality’s cruel bite. Can he guard his heart against Danny? Ten symbols were the basis for the whole of existence, symbols that had no names in any language, only an instinctual reflex of what they were for. Three would tear a small hole in the material plane even more effective than a gate. Gabriel finished the last swirl in a flourish, and then pressed his hands to the outer edges. 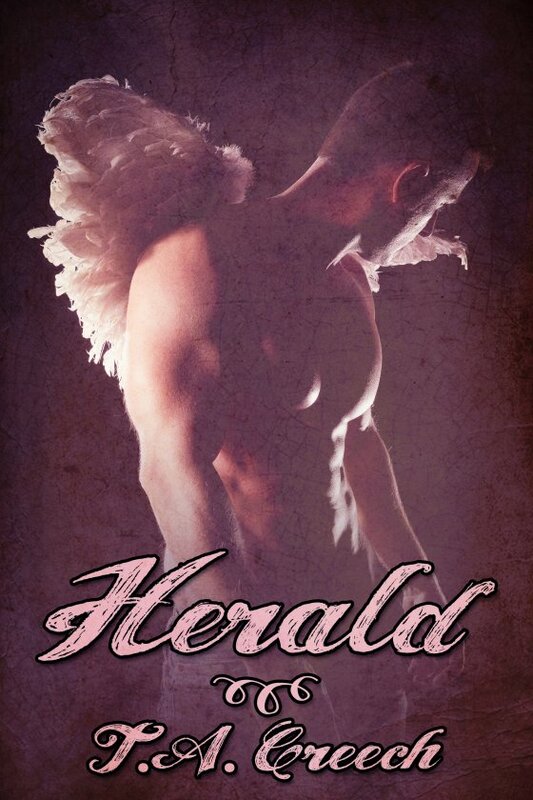 Angelic power crackled and roiled around Gabriel like a thunderstorm. Breath stagnant in his lungs, he waited until the last possible second and shoved it as hard as he could into the blood marks. At first, it felt as though he tried to move Olympus Mons with nothing but his bare hands. Sweat dripped down his face in thin rivulets as he pushed harder, until the pressure vanished as his blood on the wall absorbed the power. Gabriel gasped and stumbled back a step. The wall pulsed in his sight with a blue silver light that Gabriel had only found in his celestial home. A vicious snap echoed as fissures appeared straight through the symbols and met dead center of all three. That same light leaked out of the cracks. Inch by inch, the wall peeled away and for the second time, Gabriel looked on the Rift platform. Nothing looked out of place. The brazen edge of the gate was a storm of prismatic brilliance, a churning, pulsing hum of color and noise. Hypnotic and beautiful. Cautious, Gabriel prodded at the clear barrier between the two planes of existence. Immovable, solid, impenetrable. With a growl from the bottom of his lungs, Gabriel snatched his hand back from the gate. Damn it all. A tanned, big hand entered his field of vision and was a bare inch from touching the roiling demarcation of power when Gabriel shot out a hand and clamped down on the wrist with enough force to grind the delicate bones. Castiel squawked as he snatched at Gabriel’s pinions, but Gabriel didn’t let go of Daniel until he had backed them both far away from the hole in the stable wall. A static noise filled his ears and his skin tingled and his sight dimmed into a gray film; stopped him from shouting at his mate as the adrenaline overrode every thought. Distantly, Gabriel was aware that Daniel tried to twist his arm free of the archangel’s hand, but it required more than a few deep breathes before he could manage to let go. Even then, Gabriel needed another moment to finally lifted his eyes to his mate. “Don’t touch that,” he hissed.